Are you ready for some campy fun? 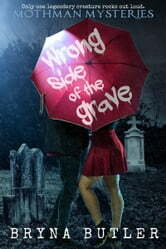 Fans of Doctor Who will love Wrong Side of the Grave, a suspenseful Teen Paranormal Mystery with a sci-fi twist. Grade 5 and up. Check out the paperback with Special Edition cover designed by Joshua Labello of Envy Ink and behind the scenes commentary on the making of the cover on the author's site.